We love Latin American sauces from tomatillo sauce to spicy Peruvian aji and flavorful chimichurri. For a dinner we hosted, we wanted a simple dip for crustini’s and pita chips that would also double as a sauce for lamb burgers (stay tuned for this post!) 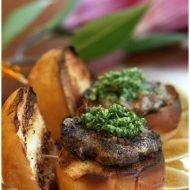 so immediately we thought the fresh summer-time flavors of chimichurri would be perfect. With origins in Argentina, chimichurri sauce is used in many Latin American countries as a sauce for grilled meats but can be used on almost anything. 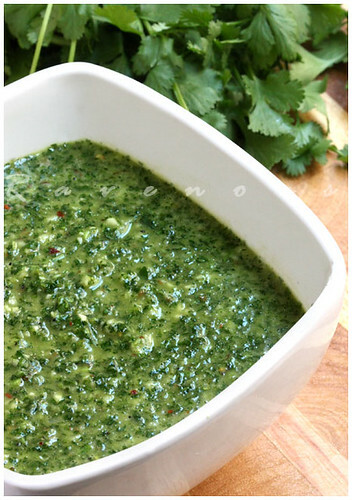 There are probably hundreds of different variations of chimichurri sauce recipes. Regardless of what variation you choose, you can always tailor it to suit your tastes. Use on grilled beef, chicken, pork or as sauce and/or marinade. Use it as a dip for breads and veggies…the possibilities are endless! We used it on some mini lamb burgers! 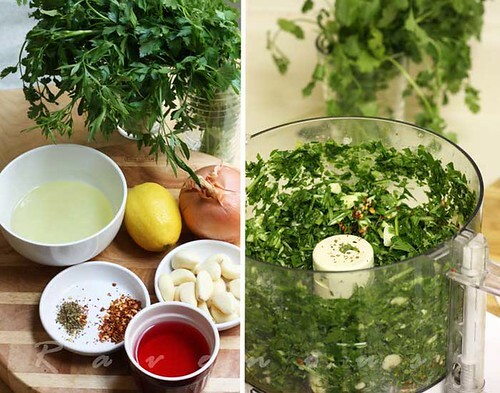 Wash and drain parsley and cilantro and remove thick stems. Pulse in blender with garlic, red pepper flakes, vinegar, lemon juice, and oregano until mildly chopped. Then slowly add the olive oil as you continue to pulse, emulsifying the sauce which will turn it slightly opaque. Pulse until desired coarseness, then season with Kosher salt and fresh cracked pepper to taste. Can be used immediately, but we find that the flavors are most intense when you let it sit in the fridge for a few hours or better yet, overnight. Nothing screams of summer more than the explosion of fresh flavors in chimichurri sauce. Try these with our mini lamb burgers which were a hit at our barbecue. I love this sauce! try it on rye bread delicious! Boy, does this chimicurri sauce looks incredible. Green and oh-so delicious. I can’t wait to try this out. It’s so easy to make as well! Fabulous. Oh this looks perfect… I’m a condiments nut. Thanks for the recipe! I eat everything with condiments, and this sauce, is by far one of the best sauce I've had! It goes great in burgers, or it can also be used as a dip. Goes PERFECT with their lamb burgers! I can't eat any other burgers with the same satisfaction after having their lamb burger and this sauce! s. stockwell: we love some heat in our chimichurri too. maybe we'll try chipotle next time. foodcreate: thanks for the tip! elyse: it's definitely as easy as it looks and sounds. try it! Rabbittrick: Try and let us know how it goes! Miscelaineous: Glad you liked it! Good to see you again and make sure you visit when we post those lamb burger recipe.